We have been thrilled with this monitor. We were considering just a sound monitor, but this being our first baby, we knew that we would constantly be wanting to check to make sure he was okay. How would we be able to get any sleep? asleep? That is when we found information on a monitor that detects motion! How perfect! So the monitor would tell us if he stopped moving / including breathing, for at least 20 seconds. The way it works is great. By the way, it also includes sound monitoring, and has 3 settings. 1) Sound Only. 2) Sound & Movement, where you will hear a tick every time he moves / breathes. 3) Sound & Movement, where you do not hear a tick, but the light on the monitor blinks every time he moves. We don’t bother with the tick. movement. Therefore, I would not recommend this as a motion sensor if you live in an apartment. We have used it in hotels, and seen that it picks up motion, even when the baby is not in the bassinet. have more false alarms in a full size crib. 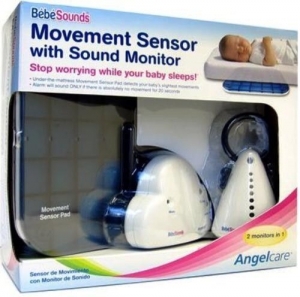 Overall, this Angelcare Movement Sensor with Sound Monitor comes highly recommended for peace of mind while you and your baby sleep. (especially for those of us who are first time parents, and just worry about everything!) Also especially for anyone who has had any problems with their baby stopping breathing during sleep for any reason, this will alert you in time to do something about it. Hopefully this kind of thing will help save some babies from SIDS.